Othokeratology (Ortho-K) is a non-surgical treatment to reshape the cornea of the eye to reduce nearsightedness (myopia) and astigmatism. The successful treatment is achieved by wearing a customized retainer lens to gently flatten the cornea during sleep. After the retainer lens is removed upon wakening, the cornea retains its flattened shape and allows clear eyesight without glasses or contact lens throughout the day. It works similarly to how the braces correct deformed teeth. It is necessary to wear these retainer lenses consistently to maintain the desirable corneal form for optimal vision. 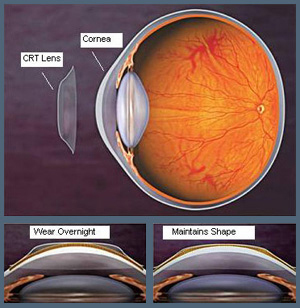 Orthokeratology (Ortho-K) is also known as corneal refractive therapy (CRT), corneal reshaping or corneal molding. Many optometrists have practiced this technology since 1960’s. With new technology in better lens design and lens material, FDA has granted the approval in 2002 for treating nearsightedness and astigmatism for patients of any age. It is especially appealing for individuals with active life styles such as athletes and swimmers because of the freedom from glasses or day-time contact lenses. The most exciting news in the Ortho-K world is the growing evidence for myopia control in developing youth. Many longitudinal studies conducted around the world have shown the promising role of Ortho-K in control myopia progression in kids. In the effort to prevent myopia progression, we highly recommend Ortho-K for any children with rapid progression in nearsightedness and emerging myopia with high nearsighted parents. If you are nearsighted and would like to be functional without glasses or contact lenses, but do not qualify or not favor for laser treatment, Ortho-K may be the perfect alternative. Schedule an appointment with Dr. Chang to determine if you are a good candidate.